Microsoft chief executive Satya Nadella has warned that embracing Artificial Intelligence without reskilling people will have an impact on jobs, even as it has displayed efficiency in delivery of government services. “I think it is an exciting future, but at the same time, you have to be very mindful of the impact of AI on jobs. 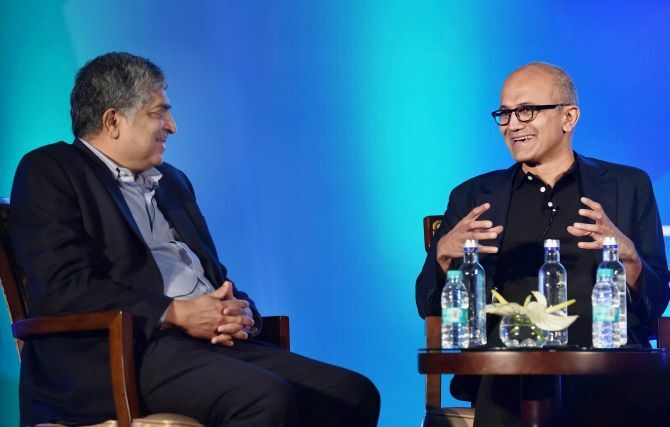 That’s why I want to make sure some of the skilling work we are doing in India is going to help people,” said Nadella at an interaction with the architect of Aadhaar, Nandan Nilekani. Nadella’s comments come in the wake of Microsoft founder Bill Gates’ call for levying taxes on robots that take away jobs from people. Nadella pointed out that Microsoft had been able to use AI to improve efficiency in government services in Punjab and Andhra Pradesh. The India-born CEO is on a three-day visit to pitch Microsoft’s Azure cloud platform as it plays catch-up with the web services of Amazon in the country. He signed a deal with Flipkart to host its services on Azure. So far, about 2,000 start-ups host their services on the Microsoft platform and use its tools. Reliance Jio could not have reached 100 million subscribers without using Aadhaar to identify users and the government had saved as much as $5 billion in subsidies using the Aadhaar backbone, Nilekani said. “People can leverage data to improve their lives. For that, you need to build an architecture where millions of people can access the data. We really see this as a transformational journey for the next decade,” said Nilekani. “If all these technologies can be used for empowerment, they will become more acceptable because one of the challenges in the West is AI, and all these are going to knock down jobs,” he added. “The centre of entrepreneurial energy in India for us is all around the cloud. It is fantastic -- we have big brands like Oyo Rooms using Azure,” added Nadella.